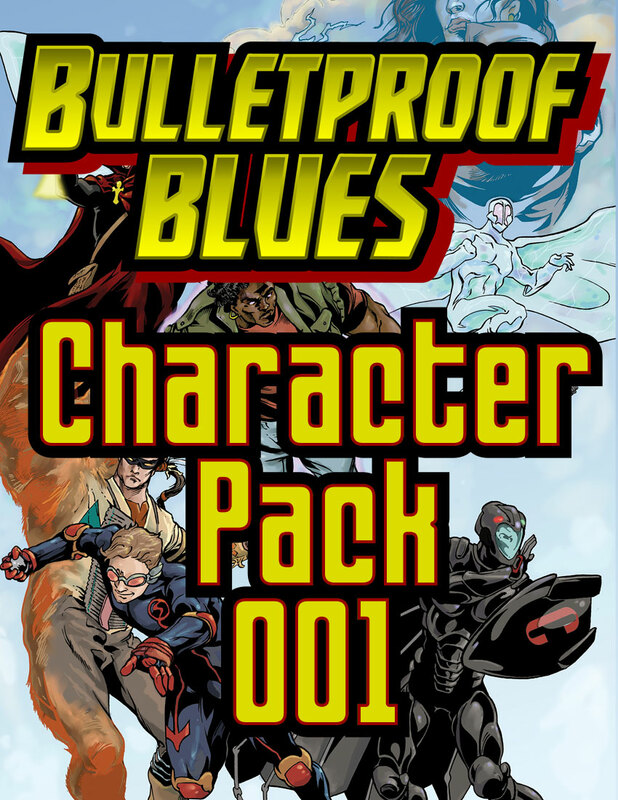 Two weeks until our Kickstarter for Bulletproof Blues Second Edition, which is scheduled to start February 1st! 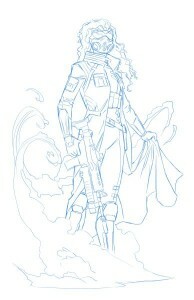 This is a sketch from Sean Izaakse: Miasma, a disgraced Canadian Special Ops officer who now leads a team of elite mercenaries. Favoring non-lethal munitions and gas grenades, Miasma and her Fume Troopers have established themselves as professionals who can get the job done quickly and efficiently, even in the face of posthuman opposition. The contest will run through the end of the Kickstarter, but don’t wait until the last minute. Send your contest entries to bblackmoor@kaloscomics.com﻿. 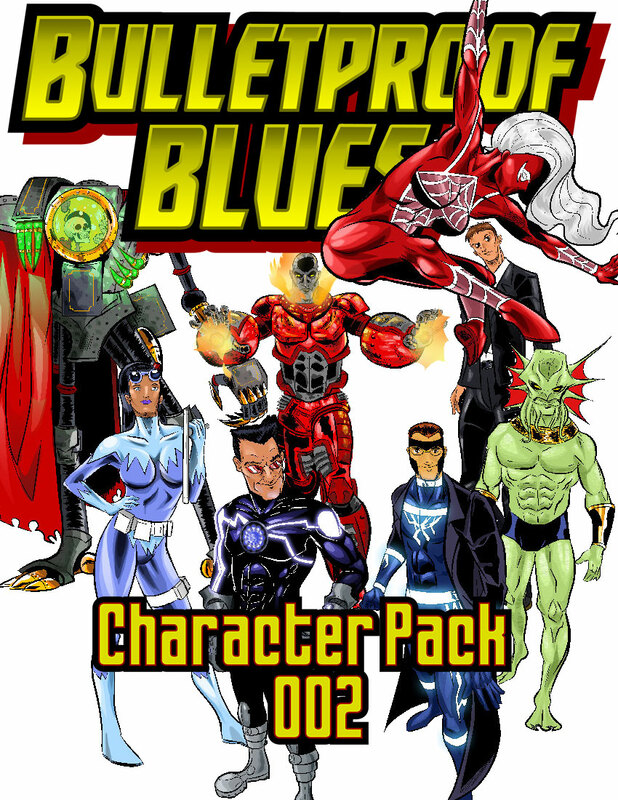 One month until our Kickstarter for Bulletproof Blues Second Edition, which is scheduled to start February 1st! 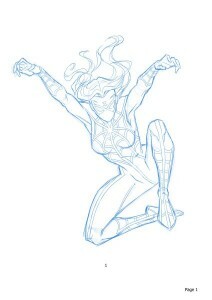 This is a sketch from Sean Izaakse: Charlotte McCoy, better known as the Widow. In her guise as Widow, Charlotte’s entire body is covered by a thin layer of extraterrestrial nanotechnological goo. The goo can take on any color or texture, but because of the neuroses of the previous wearer of the goo, it now tends to display itself in ways that represent spiders. We are laying the groundwork for our Kickstarter for Bulletproof Blues Second Edition, which is scheduled to start February 1st. This is a sketch from Sean Izaakse: Grand Duke Albert Thornmallow, also known as the Iron Lich… but don’t let him hear you call him that. You probably know that one of our goals for Bulletproof Blues Second Edition (Kickstarter coming in February!) is to completely revise the layout of the sample characters. As part of that redesign, and as a result of a recent conversation over on Facebook, we have decided to add lines for “gender” and “sexuality” (along with “eye color”, “hair color”, etc.) on the character sheets. Why? At first blush, it seems superfluous. Unlike height, weight, hair color, etc., you can’t just look at someone and tell who they’d prefer to go on a date with. However, character relationships are vital to a fun and interesting game. Even at its simplest, most superficial level, the posthuman with a secret they keep from their girlfriend or boyfriend is a staple of the genre, as is flirtation between a posthuman and one of their antagonists. So adding this information to the sample characters can help you have more fun with your games (although as always, you should feel free to change any aspect of a sample character to make it work with your game). The image sizes vary, but are generally around 3000 pixels x 4000 pixels. Everything in this pack is licensed under the Creative Commons Attribution-ShareAlike 3.0 United States License. To view a copy of this license, visit http://creativecommons.org/licenses/by-sa/3.0/us/. 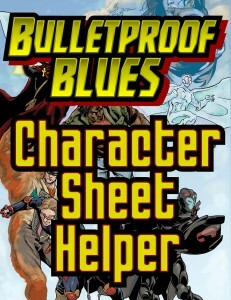 We’ve made a few small changes to the Bulletproof Blues Character Sheet Helper. Added rank numbers to WikiSheet for accessibility. Added Powers and Abilities section on Background tab. Remember to post any questions you might have to the Kalos Comics mailing list. A new character for Bulletproof Blues: Miasma, a disgraced Special Ops officer who now leads a team of elite mercenaries. Favoring non-lethal munitions and gas grenades, Miasma and her Fume Troopers have established themselves as professionals who can get the job done quickly and efficiently, even in the face of posthuman opposition. Miasma is cool, tough, and professional, but she sometimes can’t help taunting posthumans whom she has outfought or outsmarted. A new character for Bulletproof Blues: Master Sin, an immortal Korean mastermind and the head of the most powerful and extensive criminal organization on Earth. According to legend, Master Sin was an alchemist and astronomer in the court of Queen Seondeok of Silla during the Three Kingdoms period of Korea. It was during his tenure in the court of Queen Seondeok that Master Sin first discovered the alchemical secret for arresting the aging process, a formula he has continued to refine and perfect. Despite his apparent lack of posthuman abilities, Master Sin is one of the most dangerous people on Earth. His resources and his influence are both virtually unlimited. A new character for Bulletproof Blues: Manticore, celebrity super-scientist. Chloe Zhang is the photogenic, famous, and brilliant daughter of Zhang Ka-shing, one of the twenty richest people in the world. If one word could be used to describe Chloe Zhang, it would be “active”. Nearly every moment of every day is occupied with something, whether it is research into new semiconducting polymers, competing in a snowboarding competition, acting in a film on location in Mongolia, promoting the Special Olympics, or dancing at the newest and most exciting club. Fun fact: In China, Chloe’s superhero persona is known as “Dragon’s Lovely Daughter”, while in Japan, she is known as “Super Demon Rider Girl”.